NOTE: Please read edits and updates at the bottom of this post for changes and additions to the offering. Thanks! This is a small wave (8 lights) of the titanium SunDrop XR-U discussed in greater detail, HERE. The light consists of a 3S converter driving a Nichia High CRI 083B LED. The XR-U head has the same sapphire lens as that of the original SunDrop but the lens is positioned further from the LED. 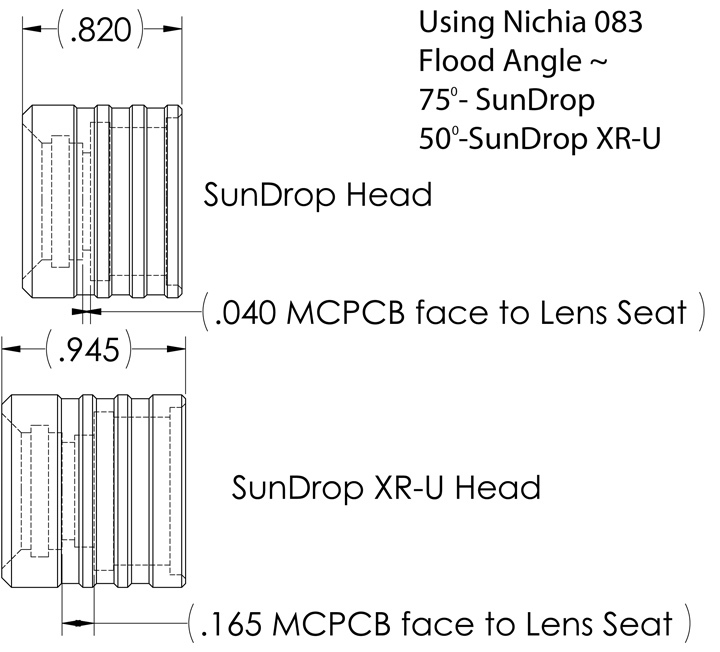 In the case of the Nichia LE, this means a tighter flood angle and higher lux. 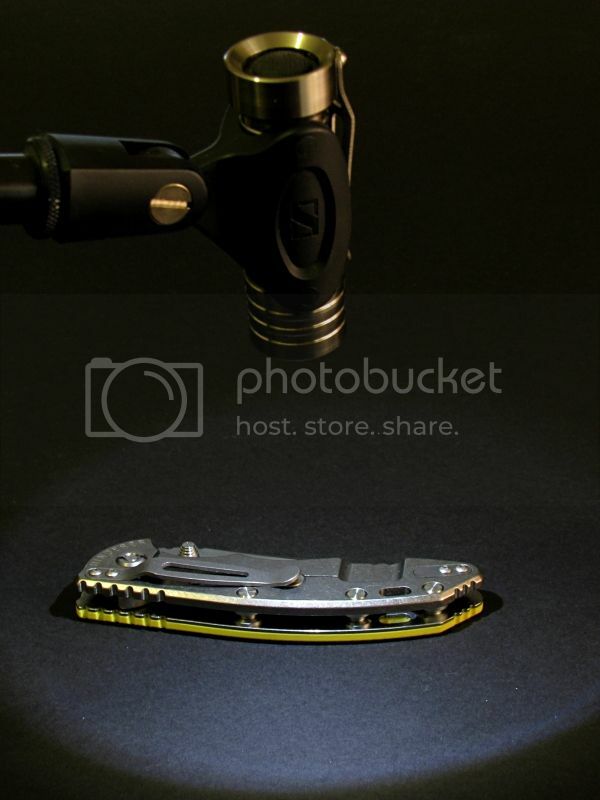 The 3S converter provides ~330 mA to the Nichia 083B High CRI LED. Medium and low levels are PWM with reduced duty cycles of this set current driving the LED and resulting in lower output. The designer of the converter has tagged the converter as a "constant color" driver. This head is also compatible with any number of other Aleph style light engines as well as the Cree 3S LE I have been using in the Haiku lights. I have called this small wave because I hope to continue to use this thread and offering for subsequent waves of these lights. I may have to close this offering for a period of time until the currently on order components arrive and I can replenish the stock. Whether I can maintain an open wave or have to open and close this offering as multiple waves, only time will tell. The price on these titanium SunDrop XR-U lights is $440 plus shipping*. For my general info on how I process these offerings, please refer to THIS THREAD. The SunDrop 3S is compatible with a single cell battery pak. The converter is a buck/boost driver capable of running from a single primary lithium or Li-Ion battery. 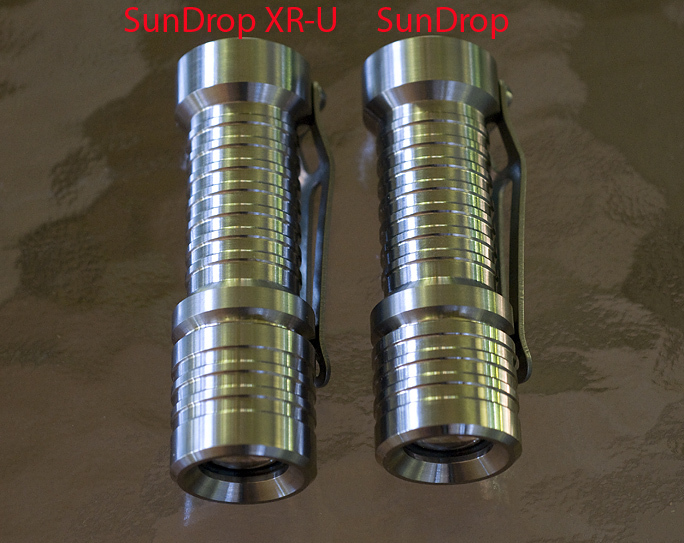 If you would like to order a SunDrop XR-U 2xAA flashlight that will have a 2xAA McClickie battery pak instead of the stock 1xCR123 McClickie Pak, the price will be $480 and please specify SunDrop XR-U 2xAA in the subject line. If you want to get a SunDrop instead of SunDrop XR-U, then use the appropriate designation in the subject line of your order request: I.E. "SunDrop" as opposed to "SunDrop XR-U"
If you have any questions, please post them at the end of this thread. Hi guys, it's about dang time I updated this first post!! The SunDrop XR-U is still available but wioth contemporary LED's. For the stock 1x123 complete SunDrop using a Nichia 119 or Cree XP-G2, the light is $440 plus postage. For a SunDrop with the XM-L Cree, the light is $445 plus postage. Since I am onlu using the SunDrop XR-U head these days, I will often identify it as just the SunDrop. The original SunDrop head is no longer in use. Email sent. Just what I've been waiting for. A perfect compromise between flood and throw with good color rendition. Thanks Don. Are both CR123's and RCR123's suitable for use in this light, Don? To my limited knowledge, yes. I say limited because I am not familiar with all of the RCR123's out there (hell any of them for that matter! ). The converter can handle the Vin of a single fully charged Li-Ion battery. Does anyone else remember when it was normal to wait 4-8 weeks for a package to show up in the mail? Well, I'm waiting for a week for a new bag now and it even hasn't arrived at the airport yet. But the difference with the days gone by is that I paid 50 bucks shipping and then I would have paid 5 US dollars shipping. And I thought that was expensive!!! That was before the invention of instant gratification. Fedex is getting pretty close to that though. This current wavelet is now all spoken for. I will edit and make a post here when the next wave is available. Thanks!! This current wavelet is now all spoken for. Speaking of spoken for......I got mine today. Beautiful, another home run (sorry Tiger fans). Thanks Don. Hey Don, can I talk you into reserving a just a light engine for me? I've already got a Mule to put it in, as you well know, but I need a Sundrop driver that's actually designed to run on one cell. I have plenty components now on hand again and these are available. I'll like one as well!! Really? Where do you see that? Ow, you can't read it, they didn't write it there, that's the problem, but it is a DB500 that needs a higher voltage because it is a buck. @mcGizmo, I'm staying tuned thanks for the update! That does look nice! I think I'm going to pull the trigger for one soon. Last edited by pockets; 11-01-2009 at 07:30 PM.